For you UC students, you must be frustrated because of the UC’s proxy because you have to change the proxy every time you use your wifi in UC and other places that use no proxy. Hei kalian mahasiswa UC, kalian pasti frustrasi gara-gara kalian harus mengganti-ngganti proxy setiap kali kalian menggunakan wifi di UC kemudian di tempat lain, dan berulang-ulang. Usually you change your proxy in Firefox using a lot of steps by going to tools menu, then select preferences, choose advanced then network, then you can change your proxy. 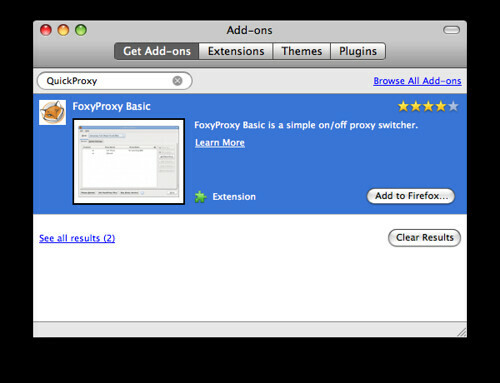 But you can switch your proxy on and off quickly and easily by using a plugin for Firefox. After you asked to restart Firefox, restart it by clicking the restart button that appear, then you will see this icon in the lower right of Firefox window if you use QuickProxy. Simply click it to turn proxy setting on or off. Setelah kalian diminta untuk merestart Firefox, restart Firefox dengan meng-click tombol restart yang muncul, lalu kalain akan melihat gambar ini di pojok kanan bawah Firefox jika kalian menggunakan QuickProxy. Cukup klik gambar itu untuk membuat setting proxy menyala atau mati. If the icon turns red, then it shows that the proxy setting is turned off and you browse without proxy. Jika gambar tersebut berwarna merah, hal itu menunjukkan bahwa setting proxy dimatikan dan kalian browsing tanpa menggunakan proxy. By the way, there is another plugin for proxy settings and it is more complex and have more features than this plugin, it is called FoxyProxy Standard (without basic). With this plugin, you can browse some page with proxy and not for other page. Check it out yourself. Omong-omong, ada plugin lainnya yang lebih kompleks dan mempunyai lebih banyak fitur.Dengan plugin ini kalian bisa browsing halaman tertentu dengan menggunakan proxy dan halaman lainnya tanpa proxy. Silakan diutak-atik sendiri. Pasti dong. Masa ngasih info yang useless?